Looking for a USED LOC650/1750 2ST? Precisely designed for the needs of the oil industry, the LOC series is named for the specifications driving its development: Lathe Oil Country. The LOC650 is capable of performing the tightest threading functions on big pipes with precision and speed. With three spindle bore variations specifically designed for this machine, it is able to accommodate large diameter pipes. Okuma's Oil Field "Threading Suite" is custom designed to combine variable speed threading and harmonic spindle control that delivers an exact match between infeed patterns and cutting increments. 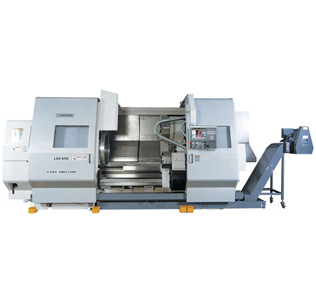 Okuma lathes are known for their power and control. Though huge in scale, the LOC650 delivers Okuma precision with optimum efficiency. Looking to Purchase a New OKUMA LOC650/1750 2ST?